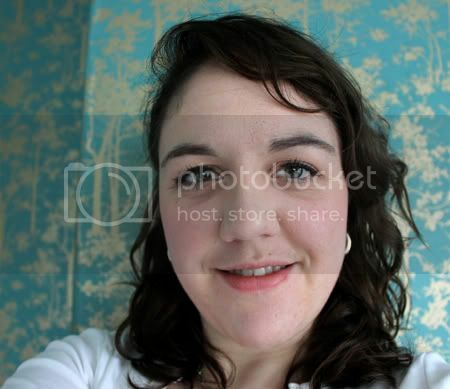 A blog documenting the experiments of a make up novice. Picture this, it's one of those mornings. You've over slept, and you're running really late, but you need to put something on your face, otherwise you might scare small children. This situation happens to me more times a week than I'd like, mostly because I like sleep a lot and I'm terrible at time-keeping. These are the products I reach for. My Five Minute Face. I've gotten this down to an art. I know where everything is, and I know how to apply it. I don't have to faff around with new or difficult techniques. I just put this on and go. It looks good, and it mostly stays on all day. My Five Minute Face products. Firstly, foundation. 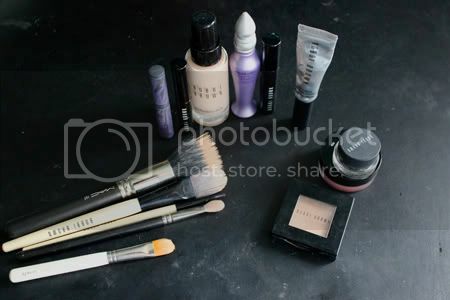 I either use Bobbi Brown Skin Foundation SPF 15 (in Porcelain) or Mac Studio Fix Fluid (in NC15). 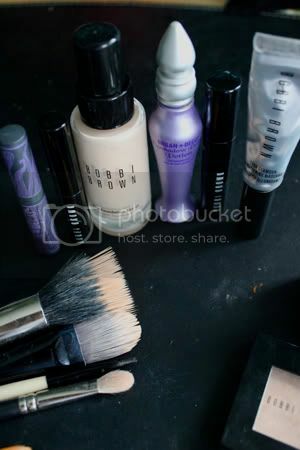 I use the Bobbi Brown foundation to layer it on, and then the Mac 187 to buff it out and make it look less streaky. 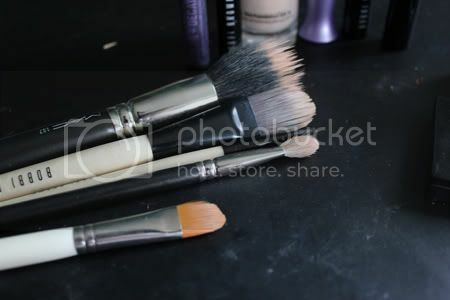 I then use Bobbi Brown's Face Touch Up Stick and the Benefit concealer brush. 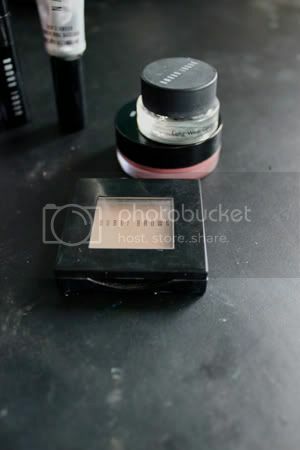 On my cheeks I use Bobbi Brown Pot Rouge in Powder Pink. Recently I've been using my Bobbi Brown highlighter pen (in Opal) on my cheek, but it's new and I've not gotten in the habit of using it yet. On my eyes I use Bobbi Brown (are we sensing a pattern here?) Tinted Eye Brightener (in Light Bisque). I'm going to do a review of this one day, because it sounds like one of those "pfft, who really needs that" products, but I find it essential! Then I use the tried and tested Urban Decay Primer Potion. For eyeshadow I reach for Bobbi Brown's Shimmer Wash (in Champagne) and then I use the gel liner in either black or brown. Mascara wise, I use Urban Decay's Skyscraper mascara. This is a mini size I got with my Primer Potion. I love love love this mascara. It's a great 'base' mascara. It separates my lashes, which are long and usually really clumpy. And then to add definition and volume I use Bobbi Brown's Lash Glamour mascara. And that's pretty much it. I usually leave my lips bare, or shove on whatever gloss is closest. I'm not really much of a lip person. Do you have products that you always reach for when you're in a rush? A primary school teacher, based in London. Obsessed with make-up, beauty and photography.